Learn how to make leaf lanterns! 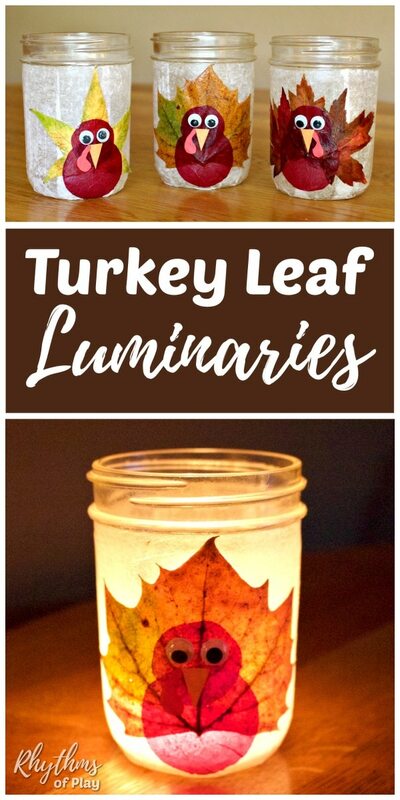 DIY Leaf turkey lanterns are a Thanksgiving lantern craft kids can make. Fall leaf luminaries like this turkey leaf craft is a leaf luminary for your fall table decorations made with mason jars and real autumn leaves. Add this gorgeous leaf lantern craft to your mason jar Thanksgiving crafts this fall! Our family is absolutely in love with how our leaf turkey luminaries turned out. Aren’t they cute? These sweet fall leaf luminaries look wonderful both lit and unlit and make a great centerpiece or addition to your Thanksgiving decorations. Gobble gobble! Learn how to make leaf lanterns today! Make this leaf turkey Thanksgiving lantern craft with your children as a fun Thanksgiving craft project the whole family can enjoy together. Your children will be so happy to see their fall leaf luminaries adorn the Thanksgiving table. Our daughter gets a kick out of seeing the leaf lantern that she made several years ago come out of the Thanksgiving box looking just as amazing as the day she made it. She can’t help but squeal, “My leaf turkey!” every year! 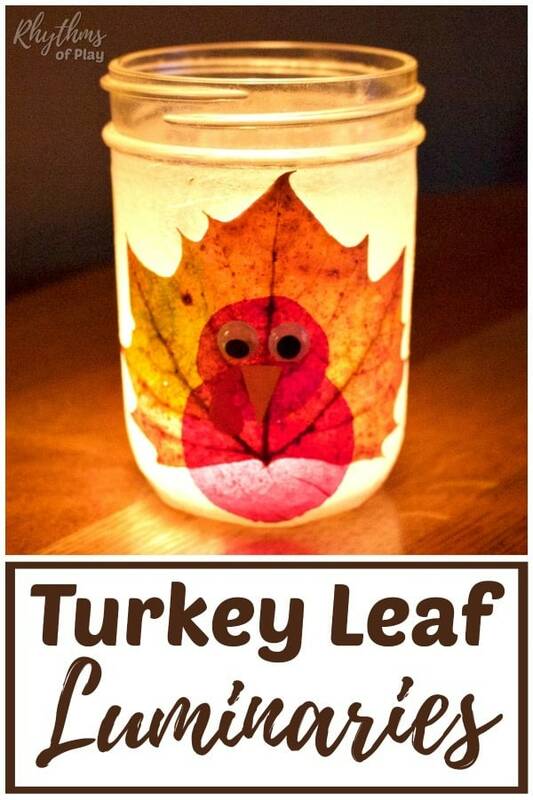 This leaf turkey fall leaf luminary is made with mason jars and real fall leaves but you can also use silk leaves. Read through the directions to learn how to make leaf lanterns before starting to make your fall leaf luminary Thanksgiving crafts. 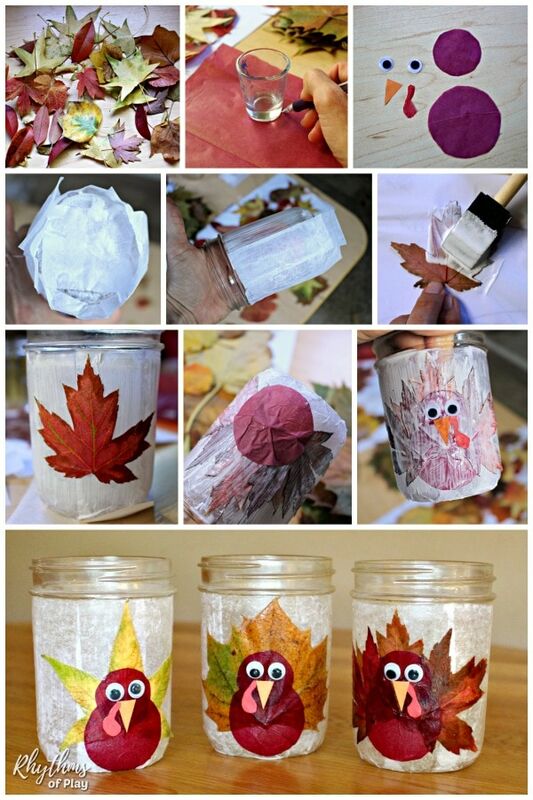 Play with arranging the leaves on the canning jars and decide how you would like to place the autumn leaves. We used fresh fall leaves, but you can also use preserved fall leaves or silk fall leaves. Strips of white tissue paper 1 1/2 to 2″ wide and slightly longer than the mason jar you will be using for your leaf lantern. A Small triangle out of the orange construction paper to make the turkey beak. An amoeba-like shape out of the red construction paper for the turkey wattle. Place your hand inside the mason jar to hold it and use a foam brush to apply Mod Podge to the entire canning jar below the threads. Mod Podge goes on white and dries clear. Carefully stick tissue strips onto the mason jar one by one. Place a circle or square of tissue paper on the bottom of the canning jar and wrap the strips around the bottom. You will need to apply Mod Podge on top of the tissue to stick everything down. Reapply Mod Podge to the sides and bottom of the canning jar on top of the tissue paper. This will seal the tissue paper and protect it if it gets wet. Paint Modge Podge onto the underside of each leaf and carefully arrange it onto the mason jar lantern. Position the fall leaf so that it looks like the fan of feathers behind a turkey. Through trial and error, we have learned that these fall leaf luminaries look much better when they are lit if the autumn leaves do not overlap. Overlapping leaves look beautiful in the daylight but is too dark to see the turkey well when lit by a candle. This is why we recommend using only one leaf per leaf lantern craft. You can move them around a bit once stuck before they dry, but be careful not to disturb the tissue paper. Smooth out any air bubbles by gently rubbing the leaf(s) from the center out. Use a foam brush to apply Mod Podge on top of the leaf and cover it completely. Place hand inside the jar to hold it. Apply Mod Podge on top of body circle. Apply Mod Podge on top of the head circle. Then place the googly eyes. Last place beak and wattle. Apply Mod Podge on top of beak and wattle but not the googly eyes. 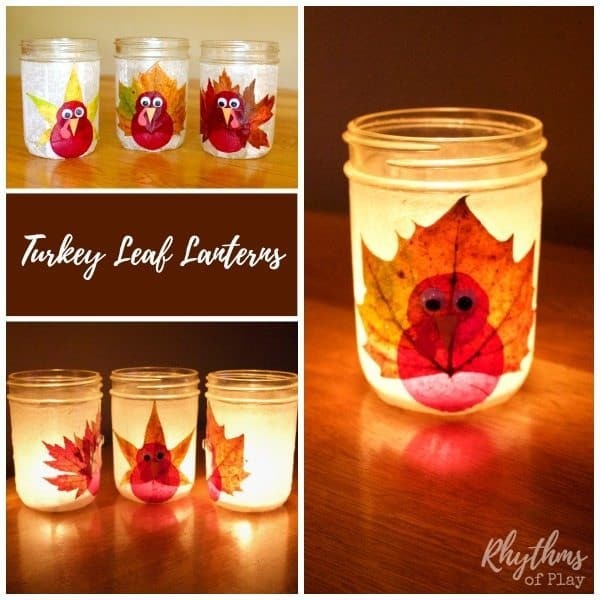 Leaf turkey lanterns are a Thanksgiving lantern craft kids can make. 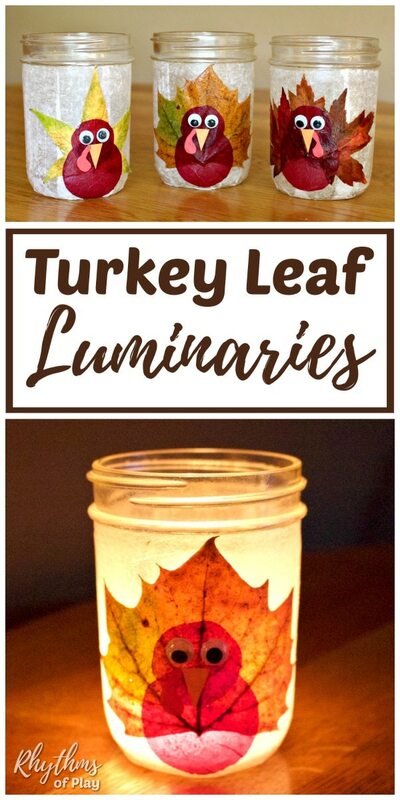 DIY Turkey leaf lantern luminaries make a wonderful Thanksgiving decoration and centerpiece for any holiday table. Add this gorgeous leaf lantern craft to your mason jar Thanksgiving crafts this fall… Make your own fall leaf luminaries today! For more fall fun be sure to check out our fall bucket list seasonal activity guide! You might also enjoy 20 Thanksgiving traditions and fun things to do on Thanksgiving! « How to Preserve Leaves: Best Methods, Tips, and Tricks! what size canning jars are these? These look so adorable! They’ll be a really cute addition to my Thanksgiving decor! do we use real leaves? Yes, Holly! We did 🙂 Use one leaf or use a few to make a fan. You can also use silk leaves. I’m so glad you like it! Thank you for including it in your Top 10 Thanksgiving roundup. Hi Anne, I’m so sorry that you are having trouble. Real leaves need to be fresh and not dried out to work. It works best if you put them on when the Mod Podge is wet on the jar and the bottom of the leaf is painted with glue.